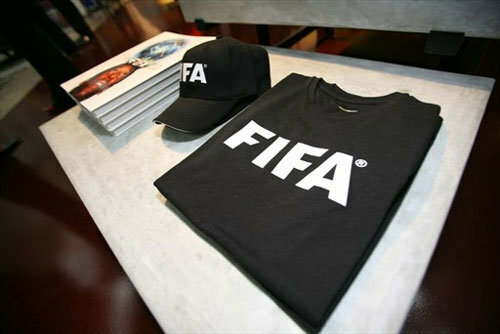 LONDON, April 19 (Reuters) - FIFA, soccer's world governing body, is branching into fashion, announcing plans on Sunday 19 April to sell branded clothes and merchandise from this summer through new FIFA stores and retail partners. The Federation Internationale de Football Association (FIFA), which groups 208 soccer associations from around the world, said it would initially launch five collections, ranging from the preppy 1904 (the year in which FIFA was founded), through the edgier, youth-focused Code to upmarket Trophy. It will also introduce an Event range for the 2010 FIFA World Cup in South Africa. FIFA said it had signed a license agreement with brand management and licensing company Global Brands Group, which is working with designers and signing up distributors. Agreements have so far been reached in five markets -- with Cooper Sports in Australia, the East India Trading Company in India, Young Turks in Turkey, Fireblade in the UK and Total Apparel Group in the United States. Deals in a further three markets are pending and six more have been identified, FIFA said. The distributors may also be responsible for creating FIFA Official Stores, the first of which opened at Singapore's new T3 terminal at Changi airport in January 2008. A second will open at Paris's Orly airport on Sept. 1 and others are being developed in London, Tokyo and Los Angeles, as well as in emerging markets like Latin America, China and India. The collections, which will be for both men and women and also include Essentials for basics like tee-shirts and Editions, which will carry logos of previous World Cup tournaments, will be sold via concessions in other retailers. A spokesman said Global Brands was in talks with department stores group John Lewis [JLP.UL] and fashion chain Next (NXT.L) in Britain, rather than sportswear groups like JJB (JJB.L).